We've been mentioned in Operation Rainfall's Facebook page ! Check this out guys and gals ! 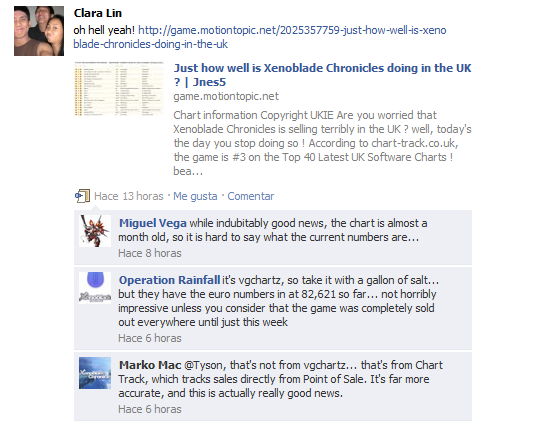 do you remember the news article I wrote about Xenoblade's sales in the UK somewhere around last month ? well, Operation Rainfall's Facebook has mentioned it in one of their posts ! sure, the news is old just like the people in the picture have mentioned, but wasn't it awesome that Operation Rainfall, one of the most well known fan campaigns, to have noticed us and maybe the website ?! Re: We've been mentioned in Operation Rainfall's Facebook page ! Who is Operation rainfall anyways. Well... it''s a small group... but with thousands of followers !